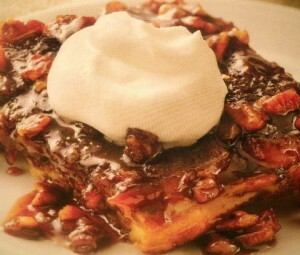 This rich, decadent, make-ahead dessert from Betty Crocker will wow your family and guests alike! 1. Heat oven to 350 degrees F. Spray a 13×9-inch (3-quart) baking dish with nonstick cooking spray. 2. In a 2-quart saucepan, combine 3/4 cup brown sugar, 1/4 cup granulated sugar, 1/2 cup butter, the maple syrup and espresso. Cook 4 to 6 minutes over medium heat until sugars dissolve and mixture is smooth; pour into baking dish. Sprinkle with 1/2 cup pecans. Top with 10 slices French bread, cutting slices in half if necessary to fit in baking dish in single layer. 3. Drizzle 1/4 cup melted butter over bread in pan. Sprinkle with 1/2 cup brown sugar and 1/2 cup pecans; top with 10 slices French bread. 4. In a large bowl, beat custard ingredients with wire whisk; slowly pour mixture over French bread. Press down on bread with spatula so all of the bread absorbs egg mixture. Cover and refrigerate 8 to 24 hours. 5. Uncover; bake 35 to 40 minutes until puffed and lightly browned. Let stand 5 to 10 minutes before serving. 6. Meanwhile, in medium bowl, beat whipped topping ingredients with electric mixer on high speed until stiff peaks form. Serve each piece upside down with a dollop of whipped cream. Makes 8 servings.